Building Collector: Buy a “micro” apartment in NYC for $100? Buy a “micro” apartment in NYC for $100? New York City real estate is competitive and has some legendarily small apartments. Micro living is one thing, but would you pay for space you can’t occupy? The Queens Museum is selling ‘apartments’ in their Panorama of the City of New York starting at $100. 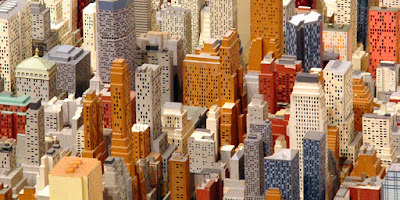 The miniature building model of the city is a Panorama commissioned by Robert Moses for the 1964 New York World’s Fair. A team of over 100 people working for three years created the city at a scale of 1:1200. Money from the Museum’s 'Adopt-A-Building Program' provides for the care of the aging Panorama. With ‘ownership,’ donors receive a title deed for their adopted property. Interesting, I wonder how many souvenir building collects will follow suit and sell space in their miniatures? Money could fund new accusations or even labor for dusting. What do you think?